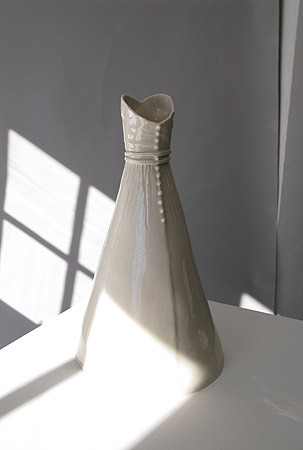 My interest in the history of dress and fashion inspired me to make porcelain vases in the shape of dresses and it wasn’t long before people began asking me if I could copy their wedding dresses. 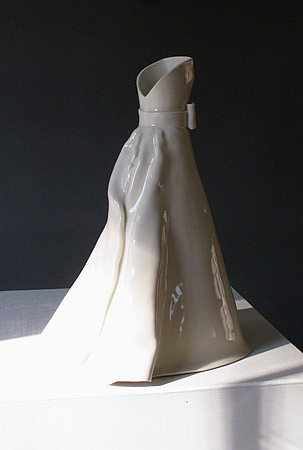 I am now occupied year-round creating custom wedding-dress vases. Dresses are ordered by mothers and mothers-in-law, husbands, best friends, bridesmaids, godmothers and aunts. For brides, they are a reminder of their special day, long after their real dress has been packed away. Clients send photographs of the original dress as jpegs attached to an email. Wedding-dress vases take from four to six weeks from when I start work to their completion. They make a perfect gift for a bridal shower, wedding day, or anniversary. 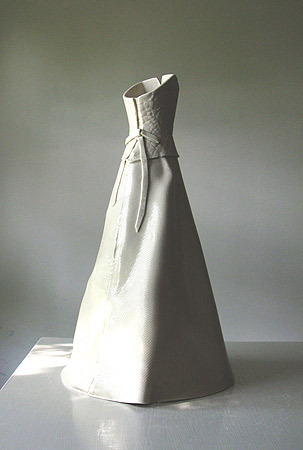 The dresses are nine inches tall, glazed inside and out with a clear glaze, and cost $200 plus $35 for packing and shipping. I can be contacted by email at diana.chamberlain.ceramics@gmail.com or by phone at (203) 263-8596.